To learn about our live music, to give comments, or for assistance with the website, please call 727-446-2642. It’s laid back and casual. Been that way since we started in 1926. We overlook the Gulf of Mexico; the beach is at our front door and the sunsets are pretty terrific. Rich and creamy, house-made chowder with shrimp, crab, red and green peppers, onions and a hint of sherry. Served with salty crackers. Corn tortillas, vegetarian refried beans, cheddar Jack cheese, fresh jalapeños, sour cream, salsa and cilantro. Corn tortilla chips piled high, black beans and sweet corn salsa, fresh jalapeños, lemon crema, melted cheese sauce, fresh cilantro and sour cream. A basket of warm tortilla chips with our house-made spicy salsa. Hot, spicy cheese served with a basket of warm corn tortilla chips. Smashed avocado, cilantro, fresh lime juice, jalapeños and green onions with warm tortilla chips. Lightly battered and fried crispy, served with a lemon wedge and house-made tartar. Dusted and seasoned, fried to perfection and served with a spicy Bahamian sauce. Queen Conch bites fried in a savory batter filled with peppers, onions and island spices. Served with Bahamian dipping sauce. Jumbo Gulf shrimp covered in coconut and fried. Served with chili-orange marmalade. 1/2-lb. of large Gulf shrimp served cold with tangy cocktail sauce and lemon wedge. Smoked fish, red peppers, celery, mayonnaise and soy sauce. Served with cucumbers, carrot sticks and crackers. Four jumbo scallops seared and served with seaweed salad, pickled ginger and zesty wasabi sauce. Served medium, hot, BBQ or teriyaki with Ranch or bleu cheese dressing and celery sticks. Seasoned with salt and pepper, then grilled on skewers. Served with Green Goddess sauce. Wild and tame greens, tomatoes, cucumbers and red onions. A choice of dressings: balsamic vinaigrette, Ranch, honey mustard or bleu cheese. Crisp romaine lettuce, garlic croutons, shaved red onion, Parmesan cheese and creamy Caesar dressing. Applewood smoked bacon, baby spinach, roasted wild mushrooms, bleu cheese, tomatoes and balsamic vinaigrette. Wild and tame greens, goat cheese, caramelized onions, shredded carrots, red peppers, walnuts, strawberries and raspberry-walnut vinaigrette. Crisp romaine lettuce, broccoli slaw, peanuts, cucumbers, citrus spinach slaw and spicy peanut sauce. Crisp romaine lettuce, avocado, black bean and corn salsa, cherry tomatoes, crispy tortilla strips and chili-lime vinaigrette. Fresh Gulf-caught grouper lightly breaded and fried. Served on a toasted brioche bun with lettuce, tomato, red onion, lemon wedges and house-made tartar sauce. Grilled or blackened fresh Gulf-caught grouper, guacamole, sprouts and house-made tartar sauce on a toasted brioche bun. Fresh Gulf-caught grouper grilled or blackened and served with lettuce, tomato, house-made tartar sauce on a toasted brioche bun. The “Best Burger on the Beach.” Our private blend of Angus beef is served on a toasted brioche bun with lettuce, tomato, red onion and a pickle spear. Our private blend of Angus beef topped with roasted red peppers, white American cheese and a sriracha blue cheese crust. Served on a toasted brioche bun with lettuce, tomato, red onion and a pickle spear. onions and zesty provolone cheese. Served on a toasted brioche bun with lettuce, tomato, red onion and a pickle spear. Whole shrimp patty, seasoned and grilled. Served with lettuce, tomato and red onion on a toasted brioche bun with cilantro mayonnaise. A black bean burger, grilled and topped with pepper Jack cheese, house-made salsa and shredded tortillas. Served with lettuce, tomato, red onion and a pickle spear. Two mini-beef burgers with American cheese and a pickle spear. Fresh grilled salmon served on sweet Hawaiian rolls with spring mix, tomato, red onion and house-made cilantro mayonnaise. Grilled sirloin steak with peppers, onions and cheese sauce on a toasted hoagie roll. Sliced mojo pork shoulder, spicy ham, salami, Swiss cheese, pickles and mustard on fresh Cuban bread. Sliced turkey served on rye bread with lettuce, tomato, red onion and chipotle mayonnaise. Marinated chicken chargrilled and served with guacamole, applewood smoked bacon, yellow rice, black beans, pico de gallo and shredded lettuce. Blackened chicken breast expertly grilled, then topped with smoked bacon and melted provolone cheese. Served on a brioche bun with lettuce, tomato and red onion. cilantro mayonnaise, topped with applewood bacon and provolone cheese. A 1/4-lb. all-beef Chicago hot dog. Served with chopped red onions and relish on a toasted frankfurter bun. Grilled and blackened Florida catch, shredded lettuce, tomato, red onion, whole wheat wrap and cilantro mayonnaise. Grilled mushrooms, hummus, red onions, sprouts, wild and tame greens, roasted red peppers on a whole wheat wrap. Grilled shrimp, romaine lettuce, Parmesan cheese, red onion and Caesar dressing. Fried chicken tossed with tangy Buffalo sauce with celery, lettuce, onion, bleu cheese crumbles and creamy bleu cheese dressing. These huge tacos are served one per order. Grilled and blackened fresh Florida Gulf grouper with lemon crema cabbage slaw, pico de gallo and cilantro topped with creamy chipotle sauce on a soft white corn tortilla. Spicy marinated chicken, lemon crema cabbage slaw, pico de gallo, shredded Jack cheese and cilantro on a soft white corn tortilla. Marinated and grilled skirt steak, lemon crema cabbage slaw, pico de gallo, bleu cheese, avocado and cilantro on a soft white corn tortilla. Fried Gulf shrimp, lemon crema cabbage slaw, tomatillo salsa, avocado and cilantro on a soft white corn tortilla. Crispy fried chicken, lettuce, queso and pico de gallo served on a soft white corn tortilla. Grilled fresh Florida Gulf grouper served with roasted red skin potatoes, green beans and fresh bruschetta topping. Line caught mahi-mahi grilled or blackened. Served on a bed of jasmine rice and black beans topped with mango-avocado salsa and roasted jalapeño crema. Grilled or blackened filet of grouper and a skewer of shrimp and scallops served over jasmine rice and green beans. Served with our chili-lime hollandaise sauce. Balsamic and ginger-glazed Atlantic salmon with roasted red skin potatoes, green beans and citrus spinach slaw. A skewer of spicy Gulf shrimp with black beans and yellow rice, guacamole and spicy tomato salsa. Jumbo sea scallops, jasmine rice, green beans and lemon cilantro hollandaise sauce. 1-1/2-lbs. of crab legs served hot with lemon wedges, drawn butter, French fries and coleslaw. A rack of applewood smoked BBQ ribs served with French fries and coleslaw. Grilled chicken breast served over black beans and yellow rice, topped with melted cheddar Jack cheese, bacon, pico de gallo, sour cream and spicy salsa. Served with black beans and rice, pico de gallo and chimichurri sauce. Jumbo Gulf shrimp served with lemon wedges and cocktail sauce. Battered and fried cod with tartar sauce and malt vinegar. Battered and fried cod, conch fritters and fried shrimp. Grouper cheeks battered and fried with tartar sauce. Lightly breaded and fried with honey mustard sauce. Vanilla bean ice cream between two cookies with key lime frosting. A smooth coconut custard filling topped with whipped cream and fresh toasted coconut shavings. Served with whipped cream, raspberry coulis and fresh raspberries. Traditional cheesecake topped with pieces of Oreo cookie, drizzled with chocolate and served with a splash of whipped cream. Rich chocolate mousse within a chocolate dome, drizzled with chocolate and accented with whipped cream and a cherry. Donut holes, chocolate and caramel sauces, coconut and cinnamon brown sugar, whipped cream and a cherry on top. Consumer Information: There is a risk associated with consuming raw animal protein. If you have a chronic illness of the liver, stomach, blood, or immune disorder, you are at a greater risk of serious illness from raw foods. If unsure of your risk, consult a physician. Reef Donkey, APA, Tampa Bay Brewing Co.
Landshark Lager, Margaritaville Brewing Co.
Coors Light, Coors Brewing Co. Angry Orchard, Boston Beer Co.
Fresh fruit muddled with brandy and cinnamon sugar, handcrafted to order. (727) 442-4312 weekdays 9:00 a.m. – 5:00 p.m., excluding holidays. The Tropical Room, an enclosed and air-conditioned space, is perfect for groups up to 90 people looking for a casual beachside atmosphere. We host a variety of events ranging from rehearsal dinners to birthday celebrations to company outings, plus holiday parties. Due to space constraints, we are unable to accommodate group events from mid-February to early May, between Christmas and the first weekend in January and holiday weekends. Cost is $45.00 per person. Choose two entrees and two sides. Add a third entree for $9.99 per person plus upcharge, if applicable. Thinly sliced steak sauteed with mushrooms, onions and garlic. Served over egg noodles. The dinner buffet is served with complimentary salad and beverages. Your choice of the Palm Garden Salad or Caesar Salad with garlic croutons. Choice of dressings for the Palm Garden Salad: balsamic vinaigrette, buttermilk Ranch or creamy bleu cheese. Sodas, coffee or ice tea. A signed contract and a non-refundable deposit are required to hold an event date. 7 percent sales tax and an 18 percent gratuity will be added. Served before 2:00 p.m. The dinner buffet is also available during lunch. The lunch buffet is served with complimentary beverages: sodas, coffee or ice tea. 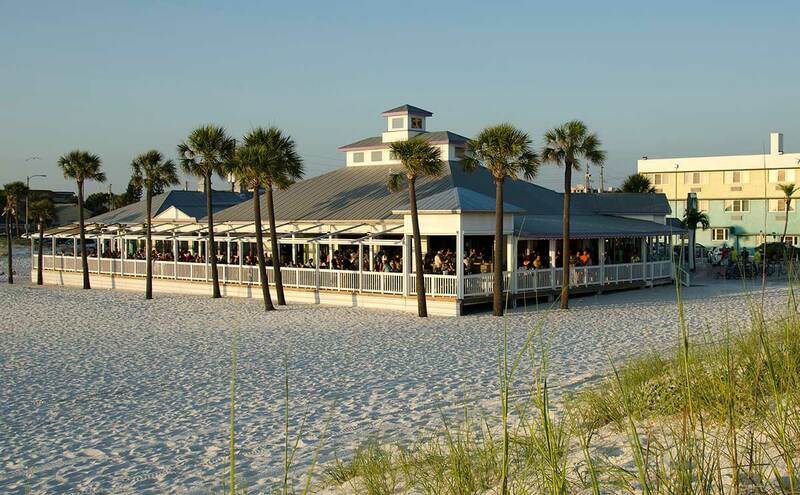 Build your own burgers with the best burger on the beach – The Palm Burger. Humanely raised, antibiotic and hormone free, it is a generous blend of sirloin, brisket and chuck. The bar comes stocked with lettuce, tomatoes, red onions, American cheese and our signature brioche buns. A delicious 1/4-lb. all-beef Chicago-style hot dog served on a grilled brioche frankfurter bun. Served with chopped red onions, relish and yellow mustard or have our foot-long corn dog. Burgers and dogs are served with crisp French fries and tangy coleslaw. Visit our seasonal fresh salad bar with a choice of romaine, spinach or wild and tame greens, cucumbers, tomatoes, carrots, red onion, walnuts, cheddar cheese, asparagus, green beans, roasted peppers and mushrooms. Your choice of dressings: balsamic vinaigrette, buttermilk Ranch or creamy bleu cheese. Assorted Italian cold cuts and cheeses prepared into delicious sandwiches on artisan bread and served with coleslaw and potato salad. Assorted wraps of chicken salad, shrimp salad and tuna salad filled with shredded lettuce, tomato, and red onion. Wraps are made of whole wheat and white flour. The platter is served with coleslaw and potato salad. Sunday to Thursday: 10:30 a.m. to 10:00 p.m.
Friday to Saturday: 10:30 a.m. to 11:00 p.m.
Daily 8:00 a.m. to 9:00 p.m.
Monday to Friday – 4:00 p.m.to 7:00 p.m.